﻿Today in the journal Nature Methods, the laboratory headed by ICREA researcher Patrick Aloy, at the Institute for Research in Biomedicine (IRB Barcelona), presents a computational tool that allows a greater understanding of the genetic causes of complex diseases such as cancer, Alzheimer's and diabetes. Scientists working in the Structural Bioinformatics and Network Biology Lab have included the more than 23,000 documented genetic mutations that affect the function of 2,000 proteins in an open-access web tool, and have positioned them on the map of known interactions between human proteins. dSysMap can be accessed free of charge at http://dsysmap.irbbarcelona.org, and scientists from around the world can add their data in an anonymous manner. Developed entirely at IRB Barcelona, dSysMap ("Disease-mutations Systemic Mapping") provides molecular details about how mutations in certain proteins alter interactions with other proteins, thus affecting the correct funcion of cellular processes. The tool has explained, for example, why mutations in a single protein can cause two distinct diseases or why mutations in different proteins can trigger the same condition. dSysMap includes information on 2,804 complex diseases. 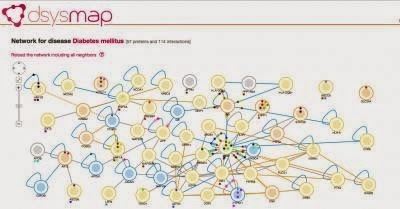 "We place the mutations in a global context of biological processes, which we refer to as systems biology or network biology; by doing this, we provide a more complete view of the effects of known pathological mutations," says Patrick Aloy, who describes dSysMap as "a hypothesis-generating system, which, in addition, provides mechanistic details at the molecular level in order to better understand complex diseases of genetic origin--which account for most diseases--such as cancer, Alzheimer's and diabetes". This is a diabetes mellitus map provided by dSysMap. The team has undertaken this project with funding from the EU's 7th Framework Programme and from a Consolidator Grant awarded to Aloy by the European Research Council. 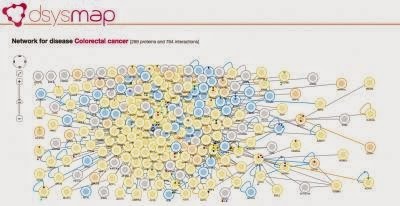 Peter Campbell, at the Wellcome Trust Sanger Institute in the UK and one of the coordinators of Pan-Cancer, recommended the inclusion of dSysMap in the platforms shared by the more than one hundred groups comprising the consortium--among them Aloy's. Through Pan-Cancer, researchers are analysing 4,000 genomes from patients worldwide with different types of tumour, with the aim to identify and understand the factors underlying tumour development. "The different groups can now add the genetic mutations that they discover in the tumours to this computational tool in order to gain a more global view of their effects on the biological processes involved and to formulate new hypotheses," explains Aloy. A study published last November in Cell, involving the participation of Patrick Aloy and Roberto Mosca--the principal authors of the work published today--, which presented a detailed network of interactions between human proteins, laid the groundwork for the development of the tool. "We have been gathering information on mutations for years, and huge projects like Pan-Cancer will detect even more, but until now we did not have an interaction map of proteins that was dense enough. The study published in Cell doubled our knowledge in this field, and dSysMap combines all the data available to ensure a greater scientific yield," argues Aloy. The reliability of the data provided by computational means has been tested experimentally with specific example in the Experimental Bioinformatics Lab, a joint facility of IRB Barcelona and the Barcelona Supercomputing Center. Originally posted by Institute for Research in Biomedicine (IRB Barcelona).